Strange business model...lots of free samples but no posted prices. After someone ordered anyway, found out that small sundae was $7! Capt Cookie has ice cream sandwich with 2 cookies for only $4. May be good but overpriced and deceptive not to post ANY prices. It was my first time trying it on Virgina Ave., N.W. Actually, someone refer it to me. I really enjoy the service, ice cream, and music. Everything was just FANTASTIC!!!!!!! I will order from them again!!! I cannot believe that this small cup cost $7.00! It's totally not worth it. Yes, the custard is good but $7.00 for this little cup is ridiculous. I will never go back and I've spread the word to my co-workers who, once they saw the size of the cup and I told them the price, just laughed. The service was really bad. The cup that they put the frozen custard in was too small so the custard spilled all over. I had to ask for a cover, and the cover did not fit and blew off. They refused to put the cover on for me even though one of my hands was full with a second Concrete I had ordered for a friend and insisted on putting a big spoon in the cup overwhich no cover could ever fit. Even though I asked for a cover, they put the big spoon in the cup and handed it to me separate from the cover. They watched, without offering to help, as I had to put the cup on the ground, take out the spoon, throw it away, and put on the ill-fitting cover. They seemed offended that I threw the spoon away. They also did not have any bags. The cup they handed me was dripping with sticky frozen custard and by the time I got into my office building most of it had dripped down the front of my blouse and all over the bottom of my skirt. Still trying to get this out. This is absolutely one of the best trucks out there!! Please come back to the Navy Yard!! OMG, best dessert food truck in DC! Great service, great custard (Oreo) stop by and try! You'll love it. thoroughly satisfied;).I am not usually fond of vanilla ice cream but Goodies custard apple crisp really pleased my sweet temptation. Good luck and continued success. PB cup was pretty good, not the best thing ever. It was blended completely smooth, there were not Reese's chunks to be had (or enjoy). Also, while Goodies accepts CCs, they impose a 25-cent surcharge, which isn't explicitly listed. 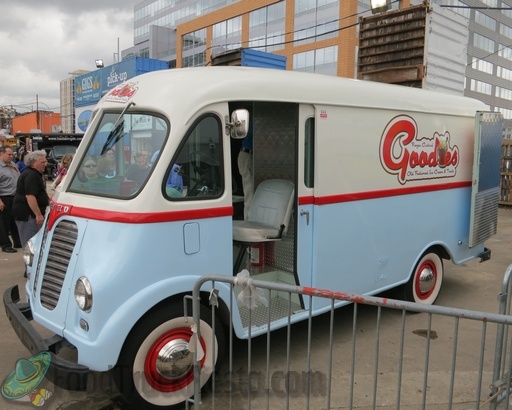 Goodies Frozen Custard & Treats food truck is DC’s first and only Gourmet Frozen Custard and vintage/retro mobile eatery. One of their offerings is described as gourmet Indonesian Vanilla Frozen Custard. They are permitted in DC and launched on April 5, 2012.